It’s time for another status update! Y’all are busy people, so let’s not waste any time and get right to the point. Let’s start from really good news – our Merchant Marketplace app just received certification from Verifone – big step towards GRAFT acceptance by brick-and-mortar merchants and a product of 6 months long development cycle in close communication with Verifone. We are working on improving this application as well as building apps for other major players in the area of hardware payment terminals such as Ingenico. Also, we just started designing the online shopping cart integrations – the first implementation is going to be an integration with Shopify, one of the most popular online store platforms. While it’s not within GRAFT’s charter to produce all the integrations, we take it upon ourselves to provide reference integrations with few leading platforms, paving the way for the independent software developers to take GRAFT to all other platforms. It’s not a big secret that GRAFT has been forked from Monero – in order to be able to reuse the best (as of today) implementation of Cryptonote protocol, which is the most secure blockchain protocol so far, at least for people who care about their privacy. The idea was (and still is!) 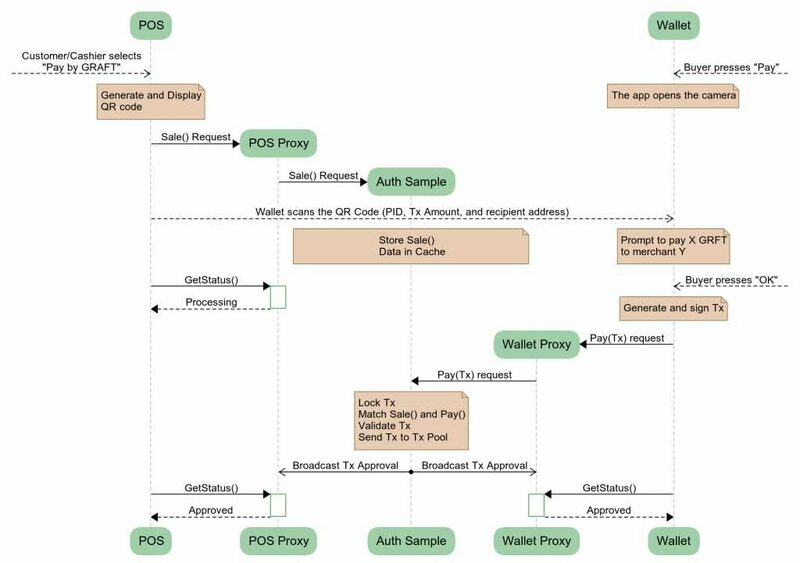 to take the open source Cryptonote technology and use it as a tier-1 foundation of the future 2-tier application platform, when the 2nd tier consists of the network of full supernodes (please read the white paper for more details). So the GRAFT dev team was supposed to be mostly focused on design and implementation of the tier 2 from the beginning. Unfortunately, sometimes our plans diverge reality in unpredictable ways, and we admit that it was naive assumption. Instead of working on core development tasks, significant part of the team had to address several problems caused by network difficulty and timestamp manipulation attacks. As a result, we switched to more efficient difficulty adjustment algorithm, which is already used by a few other blockchains, and even managed to improve it. We also followed the majority of Cryptonote community and implemented ASIC-resistant code. We appreciate a concrete help we receive from the community, including individual contributors zawy12 and jagerman – thank you guys! It’s also worth mentioning that our full time core dev team has been growing as well – we have added two senior core developers and project/product manager. We are working on another potential modification – Cryptonote Heavy hash algorithm. Although the code change is ready, we are still testing, and haven’t made a final decision when (if at all) to switch to Heavy. We continue monitoring the situation in order to find the best time for changes that require major network update. Our top-most development priority right now is RTA and we’ve been hard at work doing the R&D and laying the foundation to meet our delivery timeframes. For those of you who are interested in details, here is the “10,000 foot view” of RTA – simplistic, optimistic sequence diagram of the RTA flow: Note that every line of text in this diagram correspondents to hundreds or even thousands of lines of the source code, so this diagram just demonstrates interactions between the main players, without going deeply into the details such as auth sample selection, fee distribution, message broadcasting, etc. We are working on various modules of the RTA so we could compile the full picture: supernode-ng server framework, porting DAPI/business logic into a new framework, and authorization sample communication, which includes both super-fast UDP-based direct communication protocol (for “urgent” messages) and “unhurried” protocol (for regular message transmissions) based on existing P2P implementation. Although CryptoFind was not designed to be the core product, its popularity recently skyrocketed, and so now we cannot imagine GRAFT without CryptoFind, which becomes the most comprehensive worldwide database of businesses that accept crypto. We have implemented some new features and improvements in CryptoFind since the last update: added a text search function, which allows you to find nearby points by name or type (cafe, store, refueling, etc. ), enhanced the user interface, and created statistics page. Also we are internally monitoring multiple parameters of GRAFT servers using special tools such as CloudWatch and Nagios, we thought that the community should be able to know about the basic status (“up/down”) in real time as well, without the need to ask and repeat the same questions on forums. So we have created a simple public network status monitoring page – don’t forget to check it out!